Gina is now a Teaching Fellow at Waikato University Music Department. She has also been examining theses at the Masters Level from both Waikato and Auckland Universities. She is also maintaining her own busy studio. 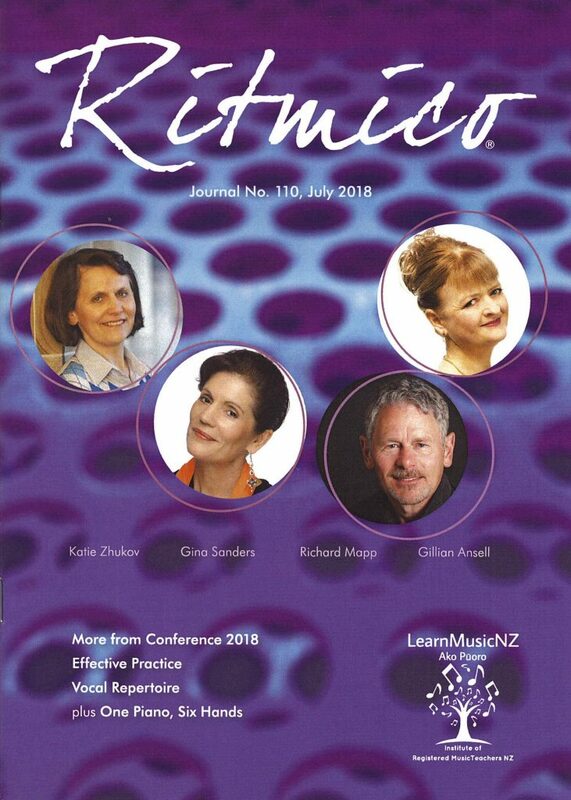 Gina is on the cover of the latest issue of RITMICO ,the magazine of the IRMTNZ The institute of Registered Music Teachers New Zealand. She was a presenter at the January Conference. Gina’s choirs and groups had a very successful time at the annual SAPACS competitions. Here is a video of Gina collecting the trophies. Gina has teaching roles with Macleans College, and King’s College. “Commendable Presentation of a New Zealand or Pasifika composition or arrangement by a choir that has not participated in the National Finale for the past two years”. Both the Chapel Choir and the newly established Girls’ Choir at King’s College, Le Coeur des Rois (“The Heart of King’s”) were awarded “Overall Commended” placings – putting them in the top half of the Auckland Festival. Some of the wonderful “Big Sing Finale” performances are shown below. Gina is the vocal advisor of this wonderful choir of young men and a large number in the choir have private vocal tuition with Gina. Gina has also been very much involved with the coaching of All the King’s Men, (assisting conductor Nicholas Forbes) which was a Finale Choir for 2015 along with Macleans College Choir for which she shares musical direction with Sarah McNabb. Several also sing in the excellent Chapel Choir at the College.